thanks for the update on the short term stochastics and guppy charts. i wish you and david luck in the spring as i thoroughly enjoyed the class last spring. i wish i could drop by but i will be abroad (with tom) next semester. Is there any chance that you would consider taping your classes and thereafter providing the video series to your readers who cannot attend your course. I believe it would be an efficient way to expand your student participation and ensure your philosophies reach a wider audience in an efficient way. I can only speak for myself but I am sure others would agree, that I would be willing to pay a tuition for this education. Great posts Dr Wish. I only wish you would not be absent so often for days at a time when the market is fluid, as recently. Then again, I need to train myself from the very short term. Your indicators and trading philosophy are top notch, if somewhat biased toward NAZ and momentum stocks. Those are risky for some of us. Hi Dr. Wish, great blog. I’m glad to see a university professor teaching trend trading philosophy. It’s a difficult and lonely road to figure out what is the truth in the capital markets. I hope to be in your class soon. Hello Dr. Wish, great blog !!! Thanks ! I look forward to your posts. Please keep them coming. A couple of questions, how do you get the Guppy chart ? Is that something that is available on regular (and free) charting software ? 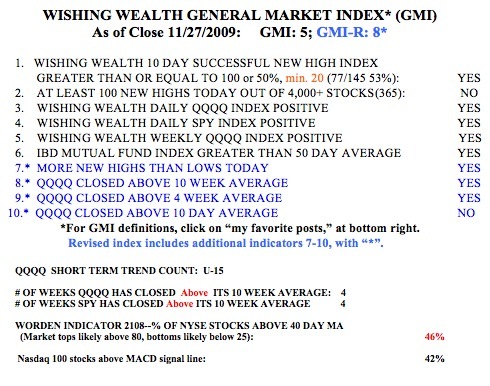 What is the QQQQâ€™s stochastics ? Thanks ! 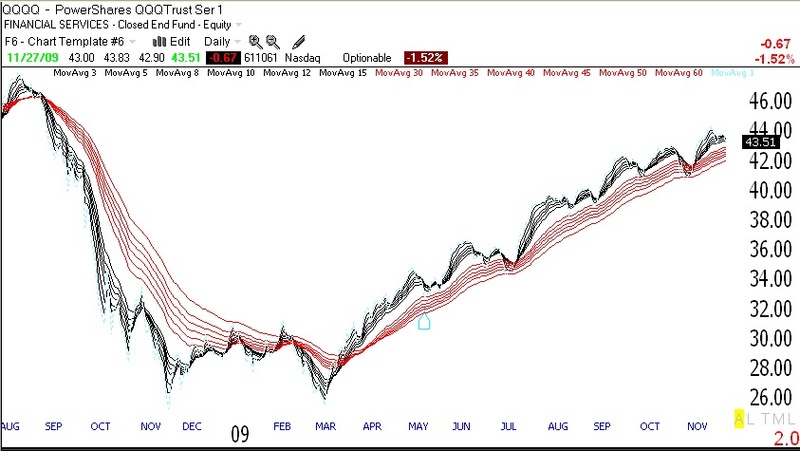 I produce the Guppy chart using the TC2007 charting program. You can use any charting program that lets you put in multiple moving averages. Stochastics is a statistic that looks at the range of a stock’s price over a given period and then assigns a number of 0 to 100 that indicates whether the last price is now at the bottom (0) or top (100) of that range, or in between. For the short term, I like to go long when the 10 day stochastic has been low, especially below 20 and then turns up. I get cautious when it has been above 80 and starts down. With regard to Proposition 3 of your trading philosophy you state that “oneâ€™s success in the market depends on identifying trends.” In research that I am doing for a statistics project, it has become glaringly apparent that many technical indicators rely on the assumption that stock prices are normally distributed. In agreement with your proposition 3, I have found that as stock prices become more stable in a prolonged uptrend they come closer and closer to a normal distribution. Subsequently, many technical indicators (I am looking at Bollinger Bands for my project) provide a significantly strengthened means of determining buy points. However, stock prices being time-series events cannot be normally distributed because they lack independence. Can you explain why this assumption of normal distribution seems to capture price movements given a stable market? Also, along with stability (reduced volatility and a clear directional trend), what are some other prerequisites for identifying an uptrend in which these indicators can be used most effectively? And finally, how do we presage the breakdown of a stable uptrend and the onset of the irrational behavior that renders many indicators useless? Thanks for all the info and keep up the good work with this blog, it has been a tremendous resource. It would be better if published daily, as another observer said if you are absent, people seem up in the air; I know we could look all of this up, if you take Worden. Dr. Wish, or should I say “Sir Silent Knight”, thanks for everything you do on the blog. You bring a unique perspective to the trading/investing blogosphere as a person who is a professional academic and successful trader. Your blog is among my top 5 favorites. Please don’t shut down your website. I read all of your posts and it has kept me on the right side of my trades. I too, have had better results this year in my mutual funds than in my trading account for the same reasons as you. You should consider charging a few bucks,like the KirkReport does, to cover your time and expenses – except for your students, of course. Please don’t go away…..You saved my skin back in ’08. Oops! I forgot to mention…..